If you're worried about Skyrim requiring players to deal with terrible DRM software, don't worry: Steamworks is the only thing Bethesda's planning on. While gamers have undoubtedly been dismayed at Ubisoft's unpleasant DRM deceisions lately, they can take heart knowing that some publishers are willing to consider other - less terrible - options. 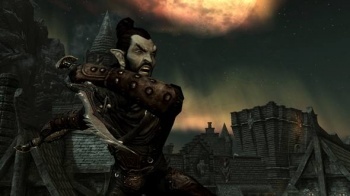 Case in point: Bethesda has revealed that The Elder Scrolls V: Skyrim will use Steamworks. Bethesda's announcement via Twitter was big news for gamers, who retweeted the announcement across the Web. Aside from the fact that Steamworks is far less frustrating to deal with DRM software that's always on, it means that Valve's Steam service will be fully integrated with the game. The Elder Scrolls V: Skyrim is due out on November 11th for PC, PS3, and 360. While Bethesda has confirmed Steamworks, there's still no word on whether or not the game will feature tentacle bears.